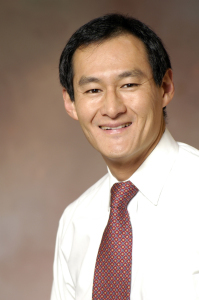 Home / Blog / Meet the Author: Q & A with ... Shi-Ling Hsu! In this installment of this occasional series, we hear from Shi-Ling Hsu, author of The Case for a Carbon Tax. Q. In the book, you make a clear case for why a carbon tax is the best policy solution to climate change. What makes it superior to other policies? A carbon tax is just the simplest and least intrusive instrument for reducing carbon dioxide emissions, and potentially other greenhouse gas emissions as well. It can be easily incorporated in an existing tax collection infrastructure, it is simple to calculate and easy to monitor. The theoretical case for cap-and-trade is similar to that of a carbon tax, but the reality of setting up a cap-and-trade program is much more complicated. Just deciding how to allocate emissions permits has proven to be an enormously trying exercise, as the political logrolling leading up to the Waxman-Markey bill illustrated. A carbon tax is also the best and most fundamental base instrument on which other climate policies might build. We could implement a small carbon tax right now and think about what else might be done later. Q. Other than reducing greenhouse gas emissions, what are some of the unforeseen benefits of a carbon tax? Right now, the most obvious benefit of a carbon tax is that it raises revenues and could contribute to a deficit reduction plan. Taxing carbon is a lot more productive than taxing income. Once the Tea Party line of no-new-taxes falls away (as it must), a carbon tax ought to surface as one of the least obnoxious ways of raising revenues. But a carbon tax will yield benefits in terms of inducing innovation that other instruments will not. Cap-and-trade and command-and-control type regulation (such as that under the Clean Air Act) requires a determination of which emitters will be covered under the program; that is difficult. The default seems to be that only those emitting at least 25,000 tons of CO2-equivalent should be covered. We can learn a lot from sources that emit a lot less than that, which comprise over 80% of the manufacturing facilities in the US. Q. If a carbon tax is clearly the best policy choice, why aren’t more politicians and their constituents in favor of it? It's completely superficial. A carbon tax has the word "tax" in it. It's been suggested to me on more than one occasion that it should be labeled a carbon "fee," not only because it would be more sellable, but because it does accurately express the idea that emitting carbon is using a resource – the atmosphere – that should require payment. I don't disagree with that, but in the end, a political battle will be fought, and a debate should be had, over what taxes we will tolerate. Politicians don't like the prospect of that, no matter what their party affiliation. A more feel-good policy might involve government programs to push along some technologies that might reduce emissions. But just throwing money at a problem will, as we have learned in the past, work much less often than it will fail. The problem is that politicians don't have any incentive for policies to actually work. What we have to have is a discussion of how effective and costly different climate policies are. Avoiding that discussion is not going to mollify critics of climate action anyway, so we might as well be honest about what it will take to reduce greenhouse gas emissions. 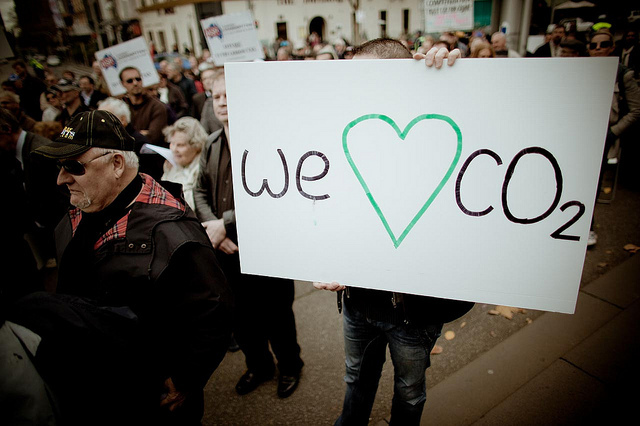 Australians rally against the carbon tax in 2011. Photo by qian, used under Creative Commons licensing. Q. Many on Capitol Hill have assumed cap-and-trade is more politically feasible. Are they wrong? They are dead wrong. Opponents have successfully, and not altogether inaccurately, labeled cap-and-trade as "cap-and-tax." To the extent that label is inaccurate, it is based on inadvisable provisions in the Waxman-Markey bill and other proposed pieces of climate legislation that have been advanced: they are provisions to try and insulate consumers from increases in energy prices. Q. Republicans are known for opposing taxes. Why do you think some conservatives are open to a carbon tax? Some honest conservatives acknowledge the need to do something about climate change; some insurance against climate change seems worth purchasing right now to try and reduce greenhouse gas emissions. Once you acknowledge the need to do something, as Jon Huntsman and other conservatives have done, a carbon tax looks so much less obnoxious than the alternatives, including regulation by the "job-killing EPA." Real conservatives listen to good economists, and good conservative economists will tell you that a carbon tax is the least costly way to reduce emissions, and by the way achieve some benefits in terms of reducing co-pollutants such as sulfur dioxide and NOx. Q. Higher taxes aren’t popular. How do you convince citizens this tax is needed? And how do you rally political support for it? Opposition to the British Columbia carbon tax was fierce, at first. The opposition party staked its electoral future on it, and it lost. The reality is that this carbon tax was imposed right in the middle of the great financial meltdown, and the effects of a carbon tax were almost non-existent. British Columbians have gotten quite used to the carbon tax and seen that it is not that big a deal. Now, you might then say, "why don't we do something that would actually reduce emissions?" There is a lot going on behind the scenes that is reducing emissions. The University of British Columbia, for example, is devoting millions of dollars in capital expenditures to maximize energy efficiency, because the carbon tax has reduced the payback periods for these investments. Reducing emissions is going to have to start somewhere, and it might most feasibly start with a series of small steps, which a carbon tax will bring about. Besides, you can't coherently argue both things against a carbon tax: that it will both do nothing and that it will hurt. Q. Do you think the U.S. will levy a carbon tax any time soon? It is unavoidable. As former Nixon economic advisor Herb Stein once said, "if something can't go on forever, it won't." Something has to be done about climate change, but subsidizing supposedly great (and usually not actually great) ideas is too costly, a point that holds special salience in these lean times. At some point, even Republicans will have to push back against an electorate that still believes climate change is bogus, and say something to the effect of "we have to do something." Once more people like Jon Huntsman, John McCain, Rob Inglis, Lamar Alexander, and Lindsay Graham acknowledge the risks of climate change, discussion has to flow to the least costly way of reducing emissions. The ultimate embarrassment will be if oil executives, including ExxonMobil CEO Rex Tillerson, begin to stump for a carbon tax, at which point the Republicans will have to answer to an electorate that rightly demands, "why didn't you think of this?"